Peapack-Gladstone resident Donna Brooten learns about an alternate positioning device from Matheny School director of curriculum Jim Hintenach. 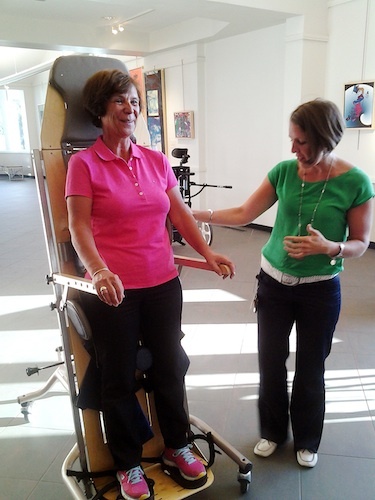 Although virtually all Matheny students and patients are in wheelchairs, they can often benefit from spending time in adaptive tricycles, standers and other alternate positioning devices developed by our physical therapists. 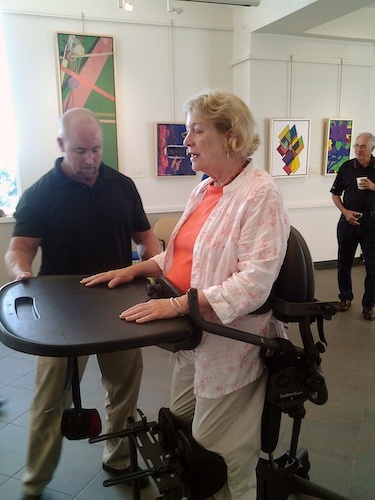 At a recent meeting of Matheny’s Community Advisory Committee, some local residents had an opportunity to try out some of this equipment and learn about its benefits. They also heard about Matheny’s adaptive physical education program which enables Matheny students and patients to play adapted versions of traditional sports such as basketball and soccer. Judy Silacci, a resident of Peapack-Gladstone, tries out a stander and learns about it from Matheny director of physical therapy Cindy LaBar. This entry was posted in Uncategorized and tagged adaptive equipment, sports, wheelchair. Bookmark the permalink. I think this was a great idea! I think it would be an Awesome experience for the parents and siblings of the kids at Matheny to experience. So the family’s can understand the day and life of there loved one!